You all are wonderful!!! I don't even live in Wamego anymore but the trip is worth it. Can't think of going anywhere else in the area. - Sabra O.
I appreciate the friendliness and professionalism of the entire staff. Communication is great! Everything was well explained so that I readily understood the procedures. - Joan M.
I was so glad to get an appointment quickly. They are very friendly and explained everything clearly. The office staff was also very friendly and made the payment schedule very easy to understand. They will certainly have my business and referrals. - Gwen L.
Great Job. 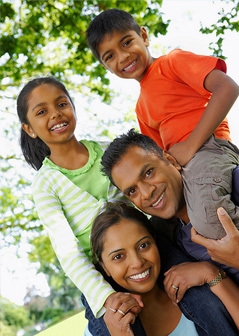 - John W.
My family loves Lesa, and everyone is so nice and friendly. We have no complaints. - Dawn E.
Thought it was great, explained everything as we went through the appointment. Great memory of talks we had 6 months earlier about family events I had going on. - Edward H.
I have severe anxiety about going to the dentist. The staff and doctor were great at helping me be more relaxed. They took time to listen to my fears and past experiences with other dentists that contribute to this anxiety and are willing to work through it. - Maureen S.
I have been impressed with my visits to your office. It has been a pleasure coming in for dental work...I don't say that very often. Thanks for making the patient feel important! - Karen J.
Christy is awesome! Kept me calm and explained everything in detail. - David B. Just want to say a HUGE thank you to Dr McQuillen and his team for giving me back my smile. You are all amazing and I can't wait to get started on the next phase. This from someone who 6 months ago was petrified of going to the dentist. You guys rock! - Denise N.
My favorite dental office ever. :) Hands down. - Tobias R.
Thank you so much Erin for all of your help and encouragement with the whole "dentist" thing. Without your encouragement I don't know that I would have been able to face my fears. I am so excited that I am able to move forward now and even an added bonus with getting new partials!! What a blessing. Everyone was so kind and gentle with this big baby, and I really appreciate it. Thanks. Love you!! 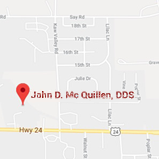 - Linda J.
Dr. McQuillen, Thank you so much to you and your staff Angel, Christy and Glenna who fixed my teeth. I so much appreciate everything you all have done for me. Thanks again, -Eloise G.
I would llike to thank Dr. McQuillen for referring me for a sleep study. I was shocked to find out that I had stopped breathing so many times during the night. Now that I have a CPAP machine and wear the mask all night, I feel so much better. Didn't realize what a good night's sleep really was. Thanks again Dr. McQuillen. -Doris Z.